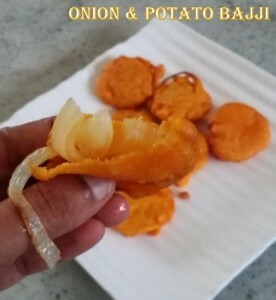 Onion & Potato Bhajji or bhaji is a spicy Indian snack similar to pakoda or potato bonda.Onion bhajjis are often eaten as starters/Appitizers to main Indian cuisine courses or sometimes as a snacks.Potato Bhajji and Onion bhajji are tasty little onion balls bound with Basan flour. 1. Wash the potatoes thoroughly and peel off the skin.Peel off the onion skin. 2. Cut them into round thin slices and keep aside. 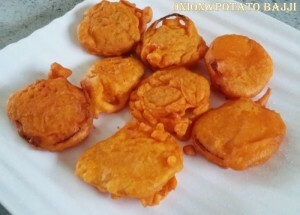 3.In a mixing bowl, add rice flour, besan flour, cooking soda, chilly powder and salt together and mix well(i used bajji bonda mix). 4. Add little water and mix to a semi thick paste consistency. The batter shouldn’t be too runny or too thick. Make ready the batter and heat enough oil in a wok to fry bajji’s. 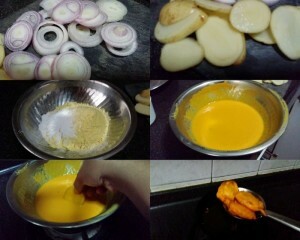 5.Once the oil get heated, dip the sliced potatoes in prepared batter and put in oil. Then flip on other side to fry equally on both sides. Then drain the oil and place it in kitchen towl. Serve hot with coconut chutney.